For those staying in Sicily resorts near the capital, Palermo, it's the perfect opportunity to explore some of the island’s most important architecture. 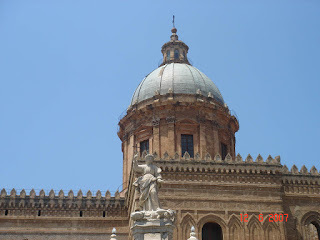 The architecture of Sicily's capital, Palermo, is an eclectic juxtaposition of Roman, Arab and Phoenician influence, which affords it an exotic ambience unique to the city. The gentle beauty of Baroque facades nudge up to elaborate Norman arches, while intricate Renaissance palaces rub shoulders with ornate, shadowy mosques in this storied landscape of ancient civilisations. The diversity of the architecture is one of the many things that bring me back to this incredible part of Italy, time and time again. For many of my clients, the prospect of immersing themselves in local history and architecture makes for an important reason to visit Sicily. Resorts close to the capital offer the perfect opportunity to explore these three grand buildings that I always recommend as a starting point. With so much history in its making, it's hard not to be impressed by this magnificent cathedral. The Cattedrale di Palermo has seen many, many changes since construction began in 1184, but despite the extensive Gothic additions made in the 15th century, it is, at its heart, one of the finest examples of Arab-Norman style anywhere in the world. I must admit to being a big fan of the Baroque style, so the Church of the Gesù (aka Casa Professa) is one of my all time favourite buildings. Situated on the Piazza Professa, while the outside may look demure and rather modest (which is typical of the 16th century), once you step inside it's a veritable assault on the artistic and religious senses. The church was the first to be constructed by the Sicilian Jesuits (in 1564) and the detail within is absolutely extraordinary. The floor plan is in the shape of a Latin cross, with countless ornamental marble reliefs and mosaics, a magnificently frescoed dome, several side chapels (added later) and a 72-metre nave, making this one of the most grandiose churches on the island. For culture buffs, the Teatro Massimo Vittorio Emanuele is the ultimate attraction: an exquisite piece of Art Nouveau architecture and the opportunity for a night at the opera to boot! I've enjoyed many wonderful evenings at this beautiful opera house and, as Europe's second largest, there is no shortage of world-renowned artists lining up to perform. Set over six tiers, Ernesto Basile's magnum opus holds its own as one of the most prestigious theatre spaces in Italy. The exterior, with its bronze lions, Corinthian columns and impressive staircase offers a hint of what's inside, which is a jaw-dropping scene of red and gold galleries and boxes (with a capacity of 3,000) offset by a magnificent domed ceiling and stage. This theatre truly is an experience in and of itself quite aside from the event you've come to see! In the many years I've been organising holidays to Sicily, resorts and hotels within easy access of Palermo are among the most requested by my clients who want to really get in-depth with the art, history and culture. But even for those who choose to stay in Sicily resorts on the eastern side of the island, I always recommend at least considering a day trip to the capital to experience these, and the many other , architectural gems of the western region.